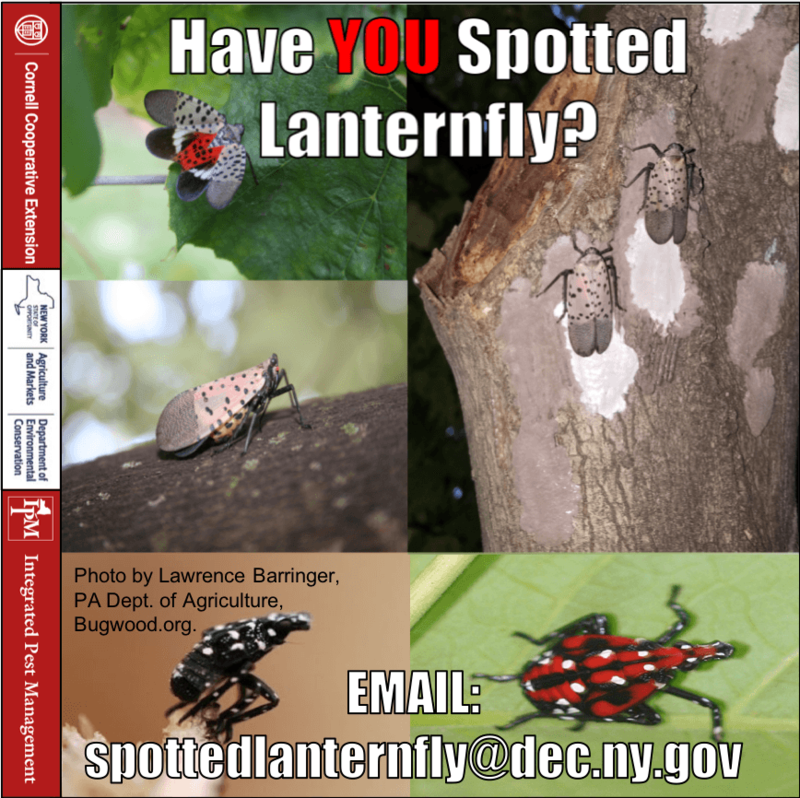 So far, the few New York state sightings of SPOTTED LANTERNFLY, a highly invasive and potentially devastating invasive insect, have been linked to their propensity to hitchhike from the quarantined areas in Pennsylvania, Maryland, Delaware and Virginia. These discoveries have been adults thought to have traveled on vehicles or shipping materials and resulted in a quick and thorough survey of the area to locate and destroy any chance of additional insects. This time of year, gravid adult females have probably finished laying eggs and covering them. They aren’t that fussy–they will lay eggs on any inflexible object (preferably tree bark) but it could be your vehicle, utility trailer, firewood, and more. The responsibility to reduce the chance of infestation in New York state also lies with travelers and shippers. While the DEC does do periodic spot checking along major federal roadways, short of placing a guard station at every entry point, this means a lot of potential influx of this pest. Share the information, learn to recognize these pests and, yes, check for hitchhikers in the form of adults, nymphs and egg masses. Once the egg mass covering has dried down from white to dull gray or grayish brown, it becomes highly camouflaged on certain surfaces like bark where its cracking mimics the surface. 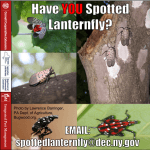 IF YOU FIND SPOTTED LANTERNFLY in New York, here’s what to do! We’re all in this together – Visit Pennsylvania’s information on management techniques. Thank you to NYSIPM’s Tim Weigle, Ryan Parker and Juliet Carroll for the resources.